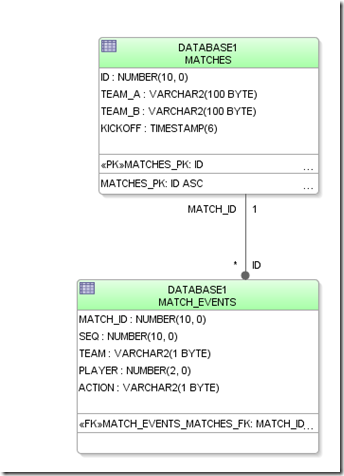 One of the very nice new features in SQL in Oracle Database 12c is the MATCH_RECOGNIZE operator. 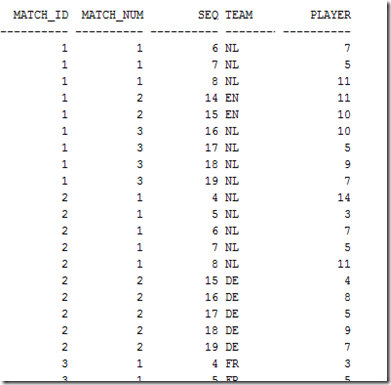 MATCH_RECOGNIZE adds a facility for spotting patterns in records. 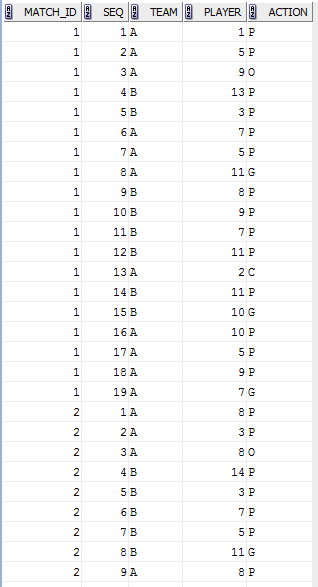 This allows us to locate records that are part of some kind of pattern relative to other records. It does sound similar to what Analytic Functions – most notably LAG and LEAD can do – but it is different. LAG and LEAD allow you to calculate the result of a record based on other records in the result set – but you are very limited in the ways in which you can indicate which other records in the result set are to be referenced by LAG and LEAD. Typically, it will be a fixed number of records before or after the record itself. MATCH_RECOGNIZE allows us to have the database find a pattern – a regular expression expressed in terms of row conditions – in a far more flexible, dynamic and almost fuzzy way. 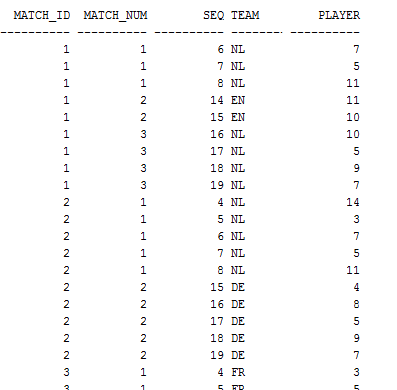 In this article, I will use this functionality to find the most valuable player in a football team (US readers: I mean the sports that you may refer to as Soccer). My definition of the MVP is the player who is most frequently part of a period of uninterrupted ball possession ending with a goal. Whether the play scores the goal, presents the assist or is involved earlier on does not matter: if he was part of the play leading up to the goal – we count the contribution. 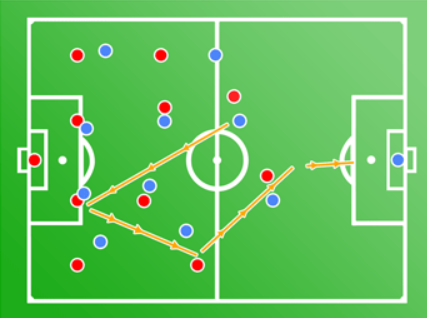 However, the ball possession ends when a player from the other team has possession of the ball. 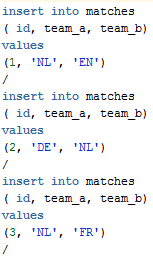 Note: the same information can also be retrieved using a recursive query (start from action = G and recurse until a different team is encountered). I will provide that example in a different article. I am also sure that some elaborate analytics with smart window definitions would probably get you there too. 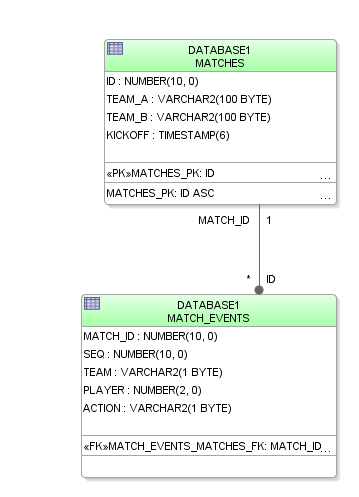 the player actions are fed into the match_recognize. 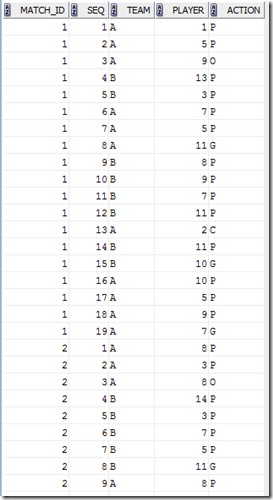 Here they are partitioned by match. 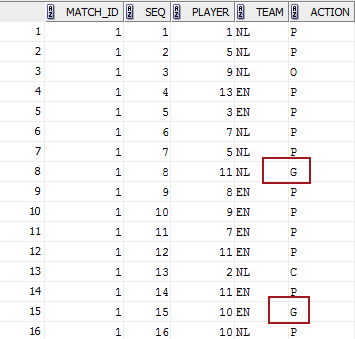 Within each match, we try to find all records that are part of a pattern that consists of 0, 1 or more possession instances – defined as a row where the same team makes the action as in the first row in the pattern – followed by exactly one goal instance. 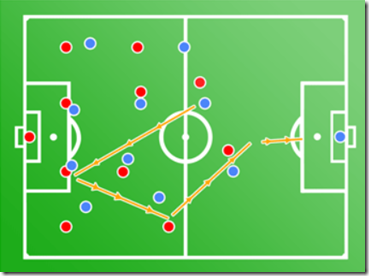 Goal is defined as an action of type G performed by the same team that did the possessions. 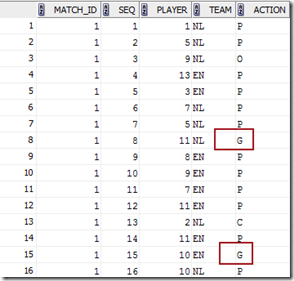 Download SQL Scripts with all statements described in this article: mostValuablePlayer. I think your use case for MATCH_RECOGNIZE is totally awesome. Great job. I have passed this link on to my pattern matching development team! I was wondering if you would like to do a joint presentation at this year’s OOW (2014 call for papers is coming will open shortly) on this topic? 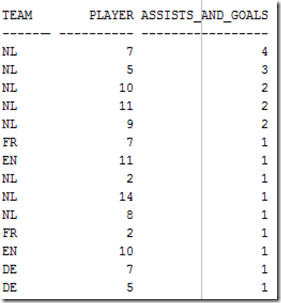 We could get data from this year’s world cup and create a really fun session around this idea of “most valuable player”. Would really like to work on this with you if you are interested. You can contact me directly at keith.laker@oracle.com.